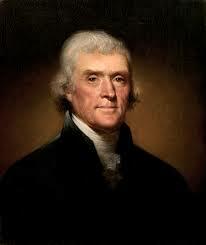 When you hear the name "Sally Hemmings" most people immediately think of Thomas Jefferson. That's because the controversy continues to rage after hundreds of years: Did Thomas Jefferson father children by his black slave, Sally Hemmings? Jefferson has often been criticized for being a hypocrite, speaking out against slavery but owning slaves himself at his home at Monticello. The truth is far more complicated than that. As we learned on the tour of James Monroe’s Ash Lawn-Highland (which is also in Charlottesville, the laws at the time stipulated that if a slave were given his freedom, he had one year to leave the state of Virginia for the north, or lose his freedom. But his still enslaved family members would have to stay behind. So giving a slave his freedom would have meant tearing him away from his family. In addition, there was the question of how a slave could live if he were freed. Few could read or had any skills for earning a living on their own, even if someone were willing to employ them (and many employers wouldn’t if they had free slave labor). Indeed, in his writings 100 years before the Civil War, Jefferson warned of what would happen if hundreds of thousands of blacks were suddenly freed with limited viable work skills and even less education...and of how they would be resented by a population of whites suddenly deprived of the labor it took run their economy. The result is the racial resentment and poor socioeconomic status of many southerners—black and white—today. So one could argue that by keeping his slaves and treating them well, Jefferson was, in a sense, protecting them. There is no doubt that Jefferson personally did treat his slaves well. On the other hand, according to Alan Crawford, author of “Twilight at Monticello,” a fascinating book about Jefferson’s last years, there were occasions in which visitors did mistreat Jefferson’s slaves, and Jefferson did nothing to stop them. While Jefferson had his own code of honor, he was reluctantly to impose it on others. 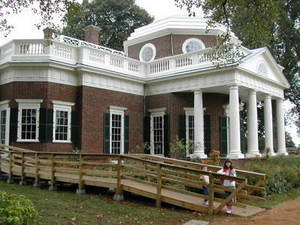 Did Jefferson Father Children by His Slave, Sally Hemmings? Then there’s the Sally Hemmings issue. On many Monticello tours, people ask whether it is true that Jefferson fathered one or more children by Hemmings, one of his light-skinned black slaves. We still don’t know for sure, but recent evidence makes it highly probable. In “Twilight at Monticello,” Alan Crawford cites considerable evidence—including incriminating but inconclusive DNA evidence-- that four of Hemmings’ children may well have been sired by Jefferson. One of the arguments against this view is Jefferson simply lacked the privacy at Monticello to carry on such an affair without definitive evidence of it. They cite Monticello’s open floor plan and the fact that it housed not only him, his daughter and her family, but an ongoing trail of visitors, some who would surely have noticed and commented on the relationship. But there is no evidence that anyone ever observed Jefferson and Hemmings in a compromising situation. And Crawford argues that Jefferson’s suite of rooms at Monticello is at the other end of the house (and/or a different floor) from all the other bedrooms. He adds that after Martha Jefferson’s death, the time when the relationship supposedly began, Jefferson added a circular staircase that led directly down into the servant’s quarters under the main floor...and Hemmings’ room. The most damning pieces of evidence are these. First, that all of Sally Hemmings’ pregnancies coincided immediately after Jeffersons’ infrequent visits to Monticello during his presidency. Second, that there are numerous contemporary accounts of visitors being dumbstruck by the amazing resemblance between Jefferson and Hemmings’ children. Even if Jefferson did father Hemming’s children, he never acknowledged it openly or privately, perhaps feeling that it would be ungentlemanly to even address the subject. However, he did free all Hemmings’ children upon his death, unlike his other two hundred-odd slaves whom his heirs were forced to sell to try to pay off his debts. One thing is sure: like many brilliant many of his time, Jefferson was a complicated man, particularly where slavery was concerned.